Casual set features table that extends to 113 inches, accompanied by 4 side chairs and 2 armchairs with fade-resistant cushions. Transform your backyard or patio into a refreshing outdoor retreat with the Mountain Side dining collection. 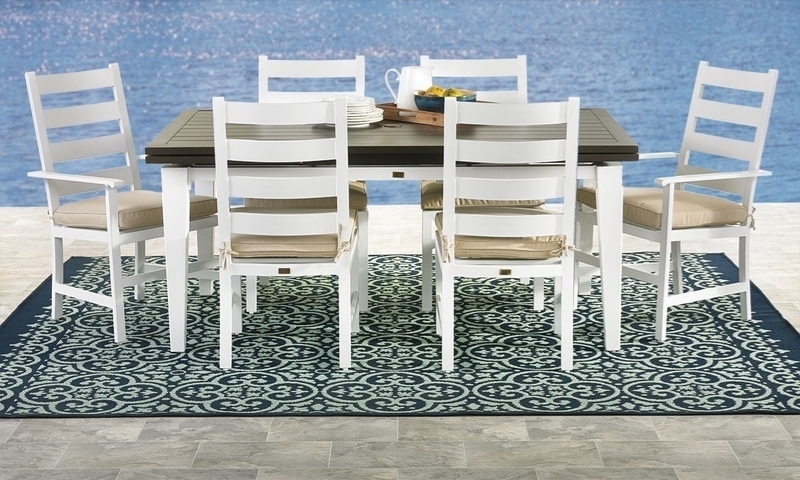 It includes a 69-inch aluminum table and six ladderback chairs in a breezy white finish. The table’s brown slat top features a self-storing extension leaf at both ends, giving it the ability to expand up to 113 inches while you entertain family and friends. Four side chairs and two armchairs round out the set, each showcasing a removable outdoor-grade cushion in fade-resistant fabric.